John Wilson is Professor of Banking & Finance and Director of the Centre for Responsible Banking & Finance at the University of St Andrews. His research focuses on banking and credit unions. 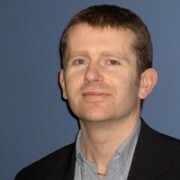 He has published over 50 refereed journal articles in outlets including Journal of Money Credit & Banking; Journal of the Royal Statistical Society; Economic Inquiry; Journal of Banking & Finance; Journal of Financial Services Research; Financial Markets, Institutions and Instruments; Cambridge Journal of Economics; International Journal of Industrial Organization; and Social Science and Medicine. John is the author/co-author of numerous books. These include: European Banking: Efficiency, Technology and Growth; Industrial Organisation: An Analysis of Competitive Markets; The Economics of Business Strategy; Industrial Organization: Competition Strategy and Policy; and Banking: A Very Short Introduction (forthcoming, 2016). John edited a five volume Routledge Major Works in Banking. He co-edited the first and second editions of the Oxford Handbook of Banking (with Allen Berger and Phil Molyneux) and the Handbook of Post Crisis Financial Modelling (with Emmanuel Haven, Phil Molyneux, Sergei Fedotov and Meryem Duygun). He is the Chair of the British Accounting and Finance Association Financial Markets and Institutions Special Interest Group. John is also a Member of Scientific Advisory Board of Charted Association of Business Schools Academic Journal Guide. Previously, he was Treasurer and General Secretary of the British Accounting and Finance Association during the period 2009-2011. John serves as Associate Editor to the British Accounting Review, European Journal of Finance, Finance Research Letters and the Journal of Money Credit and Banking. He also serves on the editorial board of a number of journals including the Journal of Business Finance and Accounting and the Journal of Financial Economic Policy. He has guest edited special issues for Journal of Banking & Finance, Journal of Economic Behaviour & Organization, European Journal of Finance, Public Money & Management and the British Accounting Review. In the period June 2011 to April 2012, John served as a full member of a Commission on Credit Unions established by the Irish Government. This Commission reviewed the future of the credit union movement in Ireland and made recommendations in relation to the most effective regulatory structure for credit unions. The Commission delivered interim and final reports to the Minister for Finance in September 2011 and April 2012 respectively.